Are you being skin smart? Sunburns may seem like an everyday annoyance, but they can be truly harmful to your skin, making you more susceptible to skin cancer and aging your appearance. It’s a smart idea to avoid being in the sun for extended periods of time or during the peak hours of 10:00 a.m.–4:00 p.m., and to always use a sunscreen that’s at least SPF 30. Watch this video to see people discover what they look like under ultraviolet light. You will come to appreciate the startling power of sunscreen! Try to limit your exposure to the sun between 10 a.m. and 2 p.m. Always use a broad spectrum (UVA/UVB) sunscreen with an SPF of 30 or higher every day. Apply your sunscreen liberally to all exposed skin, making sure you cover your ears, neck, hands, feet, scalp, lips, and around your eyes. Wear UV-blocking sunglasses with wraparound or large frames to protect your eyelids and the sensitive skin around your eyes. Reapply your sunscreen at least every 2 hours, more often if some of the product may have been removed while swimming, sweating, or towel-drying. Choose a sunscreen appropriate for you skin and/or the activities you will be participating in while you are in the sun. Wear clothing designed to block the suns UV rays or consider wearing long-sleeved shirts, long pants and a broad-rimmed hat to protect areas like the neck, ears, scalp, and face. Avoid tanning beds and tanning salons. And remember, there is no such thing as a healthy tan. 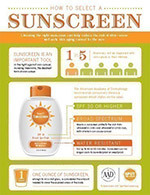 Learn more about Choosing the Right Sunscreen (courtesy of American Academy of Dermatology). Most mild or moderate sunburns cause redness and peeling of the outer layers of skin. These can be treated with cool compresses, pain medication, antihistamines, and proper hydration. More severe sunburns may affect deeper layers of skin, causing painful blisters and redness that heals more slowly. If you’re experiencing sunburn accompanied by a fever, extreme pain, headaches, or confusion, or one that lasts more than a few days, you should see a doctor right away.